I'm conducting a wee experiment in aging. It's been a tad dry in Berkeley even with the fog. When I opened up the XG Canger Tuo box- it smelled of nothing. 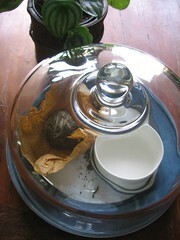 So I put the tuo under my cake dome with a jar of water, all covered for privacy. Wouldn't want the little guy to be too shy to age. 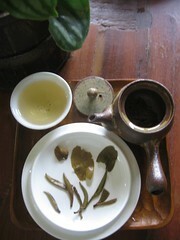 Every day, the sheng smell is slowly returning, so today I flake off a few leaves for a tasting. I normally use my lilliputian pot, wet leaves a quarter of the volume. During the first rinse, spicy notes tickle my nose. 2nd 20s, dominant peppery notes but not punchy. 6s,5s,5s,5s,5s,90s,30m spicy notes continue. It's neither floral, woody or hay moderately smooth. I'm having trouble finding the supposed camphor. While picking through the leaves, I get a pleasant sweetness on the bottom half of my tongue. Wrap up: Pepperiness is the most interesting facet of this tea. Surprising since most of the tea is buds and stems. I'll try in a few months or so to see if time in the dome produced any worthwhile results. For weeks I've been longing for a package from Kunming post. This is the last shipment of pu-erh I've promised to buy so Clees generously paypalled for me. What a sweet husband! I've been having too much trouble drinking sheng with a bit of stomach trouble so I stocked up on much ignored shus. Also I realize my collection is heavy towards Banzhang and Yiwu when I secretly like that sweetish aftertaste of Nannuo so I picked up a Nannuo and lastly a Haiwan purple bud.